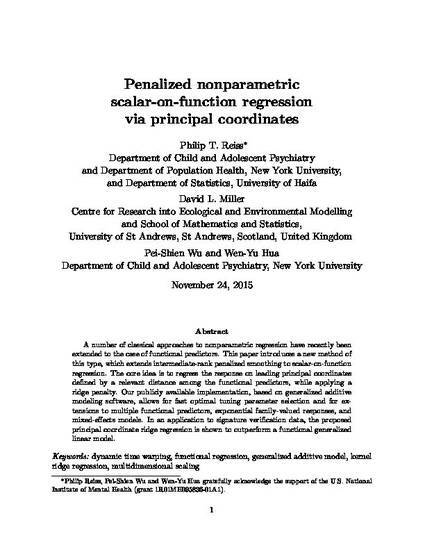 A number of classical approaches to nonparametric regression have recently been extended to the case of functional predictors. This paper introduces a new method of this type, which extends intermediate-rank penalized smoothing to scalar-on-function regression. The core idea is to regress the response on leading principal coordinates defined by a relevant distance among the functional predictors, while applying a ridge penalty. Our publicly available implementation, based on generalized additive modeling software, allows for fast optimal tuning parameter selection and for extensions to multiple functional predictors, exponential family-valued responses, and mixed-effects models. In an application to signature verification data, the proposed principal coordinate ridge regression is shown to outperform a functional generalized linear model.